How do I know if my WiFi access point can be recognized by the ARCHOS? To make sure that the ARCHOS can recognize the presence of the WiFi access point, go to Menu > Settings > Wireless controls > WiFi settings and then see what is listed under the section “Wi-Fi Networks”. One or several WiFi access points should be listed. • Because the router/modem is not switched on. • Because the router/modem access point is set to not broadcast its identity (even though it is available for use). Ask the manager of the WiFi modem/router to temporarily enable the identity (SSID) broadcasting. To do so, one would have to go into the settings of the router/modem either by using the web browser or a special application program that came with the router/modem. Search for a setting that has a name something like “Hide SSID” and make sure it is off. Once this is done, the ARCHOS should recognize the access point and be able to connect to it. The ARCHOS just needs to connect once and it will “know” this access point – even when it is later “hidden”. The WiFi router/modem can then be set back to “Hidden SSID”. In general, hiding the SSID of your modem/router is ineffective as a security measure so you might as well just leave it on. - Check your Wifi router/modem by using another Wifi device (ex: friend’s laptop) to verify that your router/modem is functioning properly. How do I download applications? Tap on the icon AppsLib found in the applications tab to see a list of available applications to download. I no longer have the standard applications that come with the ARCHOS. How can I get them? They may be still on your device but not installed. Run the installation wizard. Go to Menu > Settings > About MID > Startup wizard. If the applications are there, they will get installed. Can I download any Android™ application? Be aware that some Android applications (other than the ones in the AppsLib) require certain hardware functions that are not on the ARCHOS 7 home table and thus may behave strangely or display on half the screen or portrait mode only. A large number of fully compatible applications can be downloaded and installed directly on the ARCHOS from the AppsLib icon. Why do I get a blue Lego icon with a “?” in it, a gray box, or a message at some web sites that say I don’t have or I need to update to the latest Adobe Flash™ Player? This icon is shown on websites that have Adobe Flash™ content. The Android™ browser does not support Adobe Flash™. Why can’t I play videos on YouTube™ or other web sites? The Android™ web browser does not support the Adobe Flash™ player required for most internet sites that play video, such as YouTube™. The ARCHOS can however play .FLV formatted video files from the video player application when they have been saved to the device. Can I play music and surf the web at the same time? Yes. Just start your music playing and then tap the home icon to go back to the home screen and then start the web browser. Press and hold the home icon to be able to switch between the two applications. Can I connect an external hard drive, USB stick, or MP3 player to copy files to my ARCHOS? Yes with the upcoming USB Host adapter cable accessory. Most of the mentioned devices follow the “Mass Storage Class” protocol and could thus be connected to the ARCHOS to copy files from it to and from the ARCHOS. Can I get more games and programs for my ARCHOS? Yes, open up the applications panel on the right side of the screen and tap on the application “AppsLib”. You will need to have a WiFi connection to the Internet. You will see listings for hundreds of applications and games that you can download for free. Normally, Windows should not do this because it should see the ARCHOS device as an external hard drive, for example ARCHOS 7 (E:). If you get the Hardware installation window, your device settings may have accidently been modified. Go to Menu > Settings > Applications > Development > USB debugging and uncheck that item. The screen does not react correctly when I type on the keyboard. Sometimes it selects the wrong letter (the letter next to the one I tap). What can I do? This is merely a screen calibration problem. Recalibrate your screen by going to Menu > Settings > Touch screen calibration . Make sure you tap precisely on the x when asked to. Once done, your screen will react to where you tap on it. My ARCHOS cannot play a video file that I have copied to it. What can I do? Video files are created in many different formats as well as sizes (resolution). 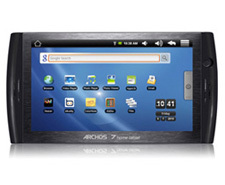 The ARCHOS 7 home tablet can play the following formats. • H.264 up to 720p resolution – 30 fps / 2.5 Mbps. You can find free and ‘for sale’ applications on the Internet that can convert a given video file to the format that will play correctly on your ARCHOS 7 home tablet. How do I get the web cam to work? This version of the ARCHOS 7 does not have a web camera built in. The round camera looking item on the right of the device may be used in the future. Can I charge my device via the USB cable? No, it can only be charged with the supplied ARCHOS charger/adapter. 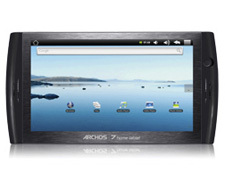 What accessories are compatible with the ARCHOS 7 home tablet? You can purchase a protective cover for the ARCHOS 7 home tablet. Accessories for the ARCHOS 5 internet tablet are not compatible with the home tablet.